What is ADP Workforce Now? ADP Workforce Now is a web-based human resources (HR) application designed especially for midsize businesses. This app gathers and automates all of your company’s HR processes into a single dashboard. You can create additional user permissions for your employees to help them coordinate and manage multiple HR functions. It also allows you to manage all your employees’ benefits, holidays and easily generate insightful reports. The app comes with a demo, video tutorials, and online support. 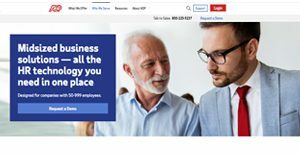 ADP Workforce Now offers core HR capabilities including time and attendance, talent management, payroll, and benefits management. It also provides a benefit plan creation wizard, which can be configured according to the on-boarding processes of your company. The app’s COBRA events can trigger notifications to employees and other beneficiaries to meet qualifying event requirements under COBRA. ADP Workforce Now coordinates your workforce management in a single dashboard. The app is fully transparent and helps you manage payroll, benefits, bonuses, commissions, time and attendance, employee health statistics, and talent management. ADP Workforce Now can be accessed on smartphones and tablets. The vendor offers mobile apps for Android and iOS that are fully synced with the web-based dashboard. This gives you full visibility of statistics and reports, and enables you to manage your HR anytime, anywhere. The software displays analytics in real-time and you can create customized spreadsheets, graphs, charts, and reports. The app is fully web based and offers hosting along with your package, featuring server audits and regular security backups. The whole software package includes a demo, online support, and video tutorials. You will get access to integrated tools and insights for your business anytime, anywhere thanks to a full cloud integration of the app. You get analytics that help you make smarter decisions, and see how your company compares against benchmark data. Through a range of flexible service options, the vendor’s experts help you manage your employer responsibilities. You can minimize administrative duties and errors with real-time payroll calculations. Plus, it’s possible to leverage the help of compliance experts to get more peace of mind. You can go beyond administration and compliance and focus on recruiting, engaging, retaining, and promoting your employees. The software allows you to improve productivity with automated time tracking, reporting features, and employee self-service that is accessible on mobile devices. Every organization has different needs and needs an application that can be customized for their size, kind of workers and customers, and the specific industry they are in. For these reasons, no platform can proffer perfect features out-of-the-box. When you try to find a software product, first be sure what you need it for. Read some ADP Workforce Now reviews and ask yourself do you need basic tools or do you need advanced functionality? Are there any industry-specific features that you are looking for? Find the answers to these questions to assist your search. There are plenty of factors that you need to reflect on and these include your finances, particular business wants, your company size, integration needs etc. Take your time, try out a few free trials, and finally choose the platform that offers all that you need to improve your firm competence and productivity. How Much Does ADP Workforce Now Cost? We realize that when you make a decision to buy HR Software it’s important not only to see how experts evaluate it in their reviews, but also to find out if the real people and companies that buy it are actually satisfied with the product. That’s why we’ve created our behavior-based Customer Satisfaction Algorithm™ that gathers customer reviews, comments and ADP Workforce Now reviews across a wide range of social media sites. The data is then presented in an easy to digest form showing how many people had positive and negative experience with ADP Workforce Now. With that information at hand you should be equipped to make an informed buying decision that you won’t regret. What are ADP Workforce Now pricing details? What integrations are available for ADP Workforce Now? Pros: I've seen how easy it is in filling out my time sheet and looking into my receoved paychecks. Before all this, we were working on timesheets from Excel --- a nightmare for our HR department tracking all of it. Again, from my standpoint, it's a useful tool that lets me view the estimated cost of paychecks, collected pay stubs, and time off requests. My company was thrilled to welcome changes made within the payroll area. Cons: There's nothing much to not like compared to what was being used before. Some of the indicated error changes would appear vague at times and a bit difficult to spot where the issue really is. But other than that, it's an awesome tool. Pros: I absolutely love how ADP can make calcualtion of your hours by week and day. I also love how this platform showcases the overall amount of accumulated sick and vacation hours. Cons: I don't like how challenging it can be when making approval on endless timesheets for people. I still need to make approval on the hours for and after looking into each single one. Plus I'm tediously goinf from one profile after the other to just approve the hours, which I feel is a process that's time consuming. Using ADP Workforce Now --- now! A big help to our rapidly growing company! For payroll, I always make use of ADP. This platform has proven to be a great asset for our growing company! ADP has brought in numerous benefits in ACA integration as well as others. If you need more information about ADP Workforce Now or you simply have a question let us know what you need and we’ll forward your request directly to the vendor.